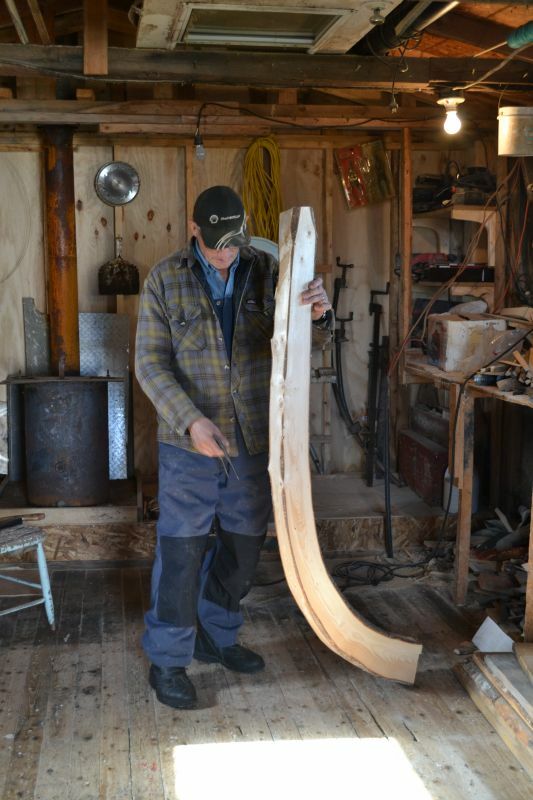 This curved timber will be used as a stem in Frank’s next speed boat. 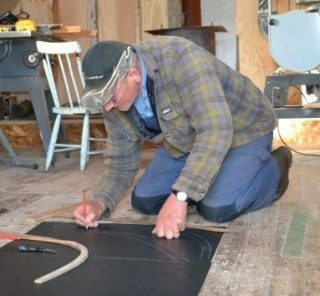 Once the timber is cut, Frank places the midship bend in the middle of the keel or slightly forward (about 2 inches), while the forehook is placed halfway between the midship bend and the stem, and the afthook is placed halfway between the midship and stern. The shape of the stem is determined by the curve in the tree, cut to suit the preference of the builder. Her counter, Frank says, is “set at a height that would make a fine run,” about 8-10 inches above the keel. Once the three main frames, the stem and counter are in place, Frank determines her sheer by eye. 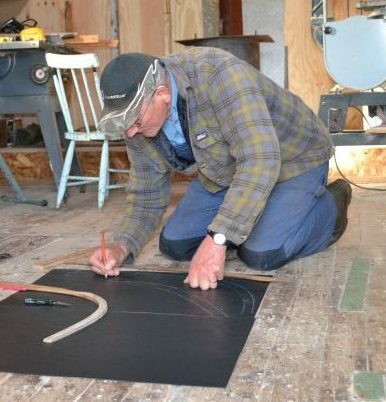 Once battened, Frank uses a copper pipe to record the shape for the remaining timbers. 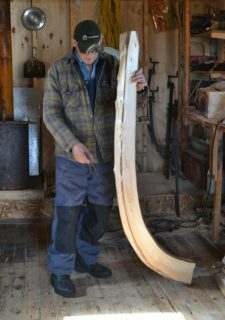 Cut from spruce, each timber is 1 inch thick at the sheer and 1½ inches at the keel. Her spruce keel is notched to receive them and they are fastened to spruce floor hooks which run out to the turn of of the bilge. For planking, Frank uses ½ inch spruce or fir, fastened with 1-1.25 #8 stainless steel screws. “Nine strakes to a side, about 4 inches wide,” he said. Between the planks, the seams are filled with spun yarn and then covered with paint mixed with sawdust as a seam compound. His sheer strake is finished with a rub rail and cap, but no gunwhale on the inside of the hull. 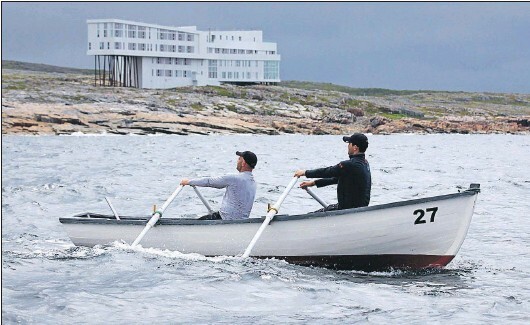 A few of Frank’s punts can be found alongside those of other local builders from Fogo and Change Islands in the Great Fogo Island Punt Race. You wouldn’t know if Mr combden still builds punts? My grandfather had one years ago. I’d love to have one built for myself.